Written on March 14, 2018 & updated on March 15, 2018. 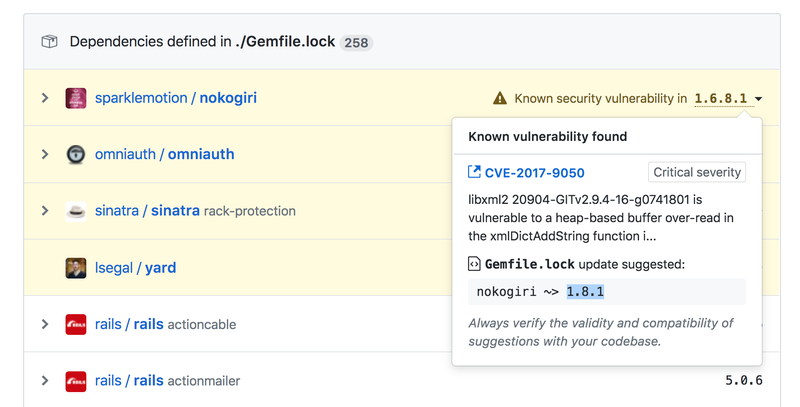 You just received notification from GitHub’s nifty new repository dependency scanner that there is a critical vulnerability report for the Nokogiri Ruby gem you currently have locked to version 1.6.8.1 in your Rails application’s Gemfile. Concerned, you decide to immediately update this dependency, run your test suite, and deploy to production to prevent even the remote possibility of an exploitation of this vulnerability in your application. Wait, what? Why is it saying “Bundle update!” if “Bundler attempted to update nokogiri but its version stayed the same”? That’s not really what I call updated. But sure. In a situation like this I really wish that Bundler would tell me why it failed its attempt to update nokogiri. Why won’t it bundle update nokogiri? There visibly was no error, so there must be a version requirement preventing this update I just requested. My first insinct is to check the Gemfile.lock and sift through any mention of nokogiri to see if there isn’t one requirement that’s a bit too strict and causing this issue. But then I stop myself. Why the hell isn’t my supposed best package manager of any language ever not doing this work for me. Why am I left grepping through a Lockfile of all things like a lowly machine? I’m sorry to say, Bundler offers no such thing. At least none that I could find in its documentation, source, issues, or pull requests. But there’s hope. The kind Joe Mastey has created a little gem called bundler-stats which allows to get some basic statistics about your Gemfile dependencies. bundler-stats can sift through your Gemfile and figure out how many transitive dependencies each of the gems declared in your Gemfile are pulling along, which is quite useful. What I wanted however is an extension to the bundler-stats show <gemname> command which finds all gems in your Gemfile which depend on the target gem. If only I could have had the version of nokogiri required for each of those gems listed alongside them I could have easily figured out which was holding nokigiri’s update back. This tells me that haml2haml (2.0.0) is being a little overspecific with the version of nokogiri it is requiring. All the other requirements should allow nokogiri 1.8.x to be installed but this one won’t. A quick check on RubyGems.org shows me that html2haml 2.1 and later fixed this restrictive requirement. This new bundle-stats versions <gemname> is not yet available in the released version of bundler-stats but it hopefully will be soon. I hope this will convince the Bundler team that this sort of feature is a must-have for a modern package manager. I honestly didn’t think I could learn all I needed to learn about Bundler to implement this as a Pull Request to Bundler but I did learn a ton about how the internals of RubyGems’ Gem::Version, Gem::Requirement, and Gem::Dependency work thanks to Joe’s work on bundler-stats. If you’re curious about this stuff, you can take a look at the changes introduced in the Pull Request. Since this post was published yesterday, Joe Mastey kindly worked with me to merge the pull request and he released version 1.1.0 of bundler-stats that now includes the bundle-stats versions command so all you have to do is gem install bundler-stats and you can start using it on your Gemfiles. He even added a lovely changelog to the project. Additionally, André Arko from Bundler reached out on Twitter to let me know that he’d accept a pull request to add this behavior to Bundler’s bundle show <gemname> command which currently prints the installation directory for a given gem. I think I’ll try to find some time before the end of the week to get started on that pull request although it’ll probably be a bit more tricky than to do this cleanly inside Bundler. If you want to help, feel free to reach out on Twitter or to open a pull request on Bundler yourself and let me know.